R. Gopalakrishnan was a research scholar in the Centre for Advanced Study in Philosophy, University of Madras from 1972 to 1976 and secured his Ph. D. in 1978. He served as Assistant Professor of Philosophy in the Arulmigu Palaniandavar College of Arts and Culture, Palani, from 1976 to 1982. From 1982 onwards he is on the staff of RAdhakrishnan Institute for Advanced Study in Philosophy, University of Madras. 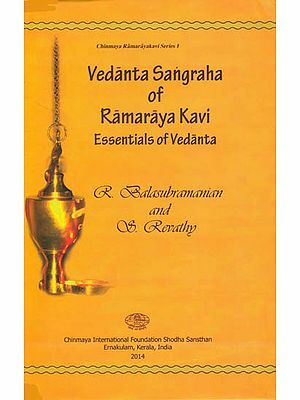 Like other orthodox schools of Indian Philosophy, Saiva Siddhanta also has a basic philosophical work, the Sivajnana-bodham of Meykandar, which contains the essential teachings of the Vedas and the Agamas. Two factors contributed to the development of the schools of Indian Philosophy. One was the commentarial tradition. The basic work of each school is in the form of sutras. The sutra-work of each school is elucidated by a commentary. There is, for example, Vatsyayana's commentary on Gautama's Nyaya-sutra. In the case of Badarayana's Vedanta-sutra, we have more than one commentary on it. Sankara, Ramanuja, Madhva, and others wrote elaborate commentaries on the Vedaata-sutra from the standpoint of the tradition each belonged to. Meykandar's Sivajnana-bodham, which consists of twelve sutras, has a commentary called Sivajnana-siddhiyar in Tamil written by Arulnandi. The Saiva Siddhanta tradition attaches great importance to this commentary on the Sivajnana-bodham coming as it does from one who was not only a contemporary of the author of the Sivajnana-bodham, but who was also one of his disciples. Tradition has it that Arulnandi wrote his commentary at the behest of his guru, Meykandadevar. The Sivajnana-siddhiyar in its turn was commented upon by others of the Siddhanta tradition. Thus, the commentarial tradition of each school has contributed to the growth and enrichment of each school. Every philosopher worth the name has not only a tradition and a point of view to elucidate and justify, but also other philosophical traditions with varying stand points to react to. The exchange of philosophical views through objections and replies, counter-objections and rejoinders, is another factor which has contributed to the development of Indian philosophy. Every philosophical treatise in India is both expository and polemical: it not only expounds and justifies, with great care and insight, its central teaching supported by pramanas such as pratyaksa, anumana and sabda, but also criticizes the teachings of others on the authority of pramnnas. This is as much true with regard to the Sivajnana-siddhiyar as it is with regard to any other important philosophical work. Arulnandi's Sivajnf1na-siddhiyar contains two parts. The first part of this work called "Parapakkam" (Sanskrit: parapaksa) is devoted to the refutation of the views of others, while the second part called "Supakkam" (Sanskrit: svapaksa) elucidates and vindicates the standpoint of Saiva Siddhanta. In this work there are altogether 629 verses of which 301 are devoted to the refutation of fourteen philosophical positions of nastika and astika schools of the Indian tradition. While there are many commentaries on the Supakkam portion of the work, there is only one commentary on the Parapakkam written by Tattuvaprakasar. So far there has been no exposition in English of the Parapakkam of the Siddhiyar. The present volume by my colleague, Dr. R. Gopalakrishnan, who is a specialist in Saiva Siddhanta, attempts to elucidate, by closely following the Siddhiyar, the standpoint of other schools, as advocated by them and the objections thereto from the standpoint of Saiva Siddhanta. I am happy to commend this book to the attention of scholars and others interested in Saiva Siddhanta vis-a- vis other Indian philosophical schools. 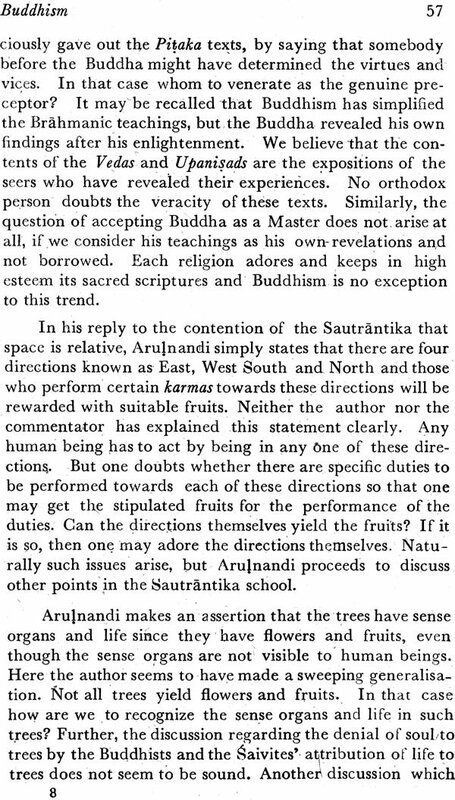 In this monograph I have attempted to set forth Arujnandi's presentation and refutation of other schools of thought. As is usual with the classical philosophers, Arulnandi's prime concern is to show the inadequacies found in the philosophical tenets of the non-Saiva philosophical schools as a prelude to the establishment of the Saiva Siddhanta philosophy, viz., Supakkam. In this work, I have not enquired whether Arujnandi's presentation of the views of other schools is authentic, but I have confined myself to the views of alien schools as presented and refuted by him. I consider that this work will enable the scholars to know the standpoint of Saiva Siddhanta with reference to other systems. I am sure that this work will serve as a prelude to a better understanding of the 8ivaj'iitlna Siddhiyar Supakkam. I am thankful to the Vice-Chancellor and the authorities of the University of Madras for permitting me to write this monograph. I thank Dr. R. Balasubramanian, Director, Radhakrishnan Institute for Advanced Study in Philosophy, University of Madras, for his guidance and encouragement. Let me express my gratitude to Dr. V. A. Devasenapathi, Former Director, Radhakrishnan Institute for Advanced-Study in Philosophy, University of Madras for his invaluable guidance. I am also grateful to Dr. V. Rathinasabapathy, Professor & Head, Department of Saiva Siddhanta, University of Madras, for having clarified many points in the text. Let me also convey my thanks to Dr. P.K. Sundaram, Formerly Professor, Radhakrishnan Institute for Advanced Study' in Philosophy and to Mr. P. Krishnan Lecturer, Radhakrishnan Institute for Advanced Study in Philosophy, University of Madras for their valuable suggestions in preparing the manuscripts. I thank M/s. Avvai Achukkoodam for executing the work on time.